Phytophthora blight and root rot is caused by fungal-like organisms belonging to the genus Phytophthora. They are more commonly referred to as water-molds due to their ability to produce asexual, swimming spores in the presence of water. Several species of Phyophthora are responsible for diseases on ornamentals in greenhouses, nurseries, and landscapes in North Carolina including P. nicotianae, P. cactorum, P. cryptogea, P. drechsleri, P. palmivora, and P. tropicalis. 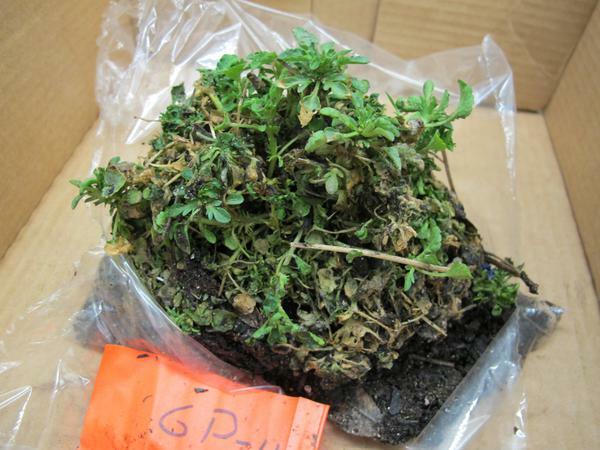 Many annuals and herbaceous perennials are susceptible to species of Phytophthora in greenhouse production and in the landscape. Annuals that are susceptible to infection by one at least one species of Phytophthora include annual vinca, dusty miller, gerbera daisy, pansy, petunia, calibrachoa, verbena, blue daze, snapdragon, begonia, calendula, annual stock, phlox, dianthus, and others. Herbaceous perennials that are susceptible to Phytophthora include lavender, osteospermum, rosemary, delphinium, epimedium, oregano, polemonium, hosta, heuchera, euphorbia, and others. Phytophthora blight on annual vinca. Symptoms vary depending on the host. For some hosts, such as annual vinca, symptoms may appear on the foliage as tan to brown or black lesions on the leaves and/or stems. For other hosts, such as petunia, a crown rot may cause plants to wilt rapidly or partially resulting in plant collapse. For other hosts, such as snapdragon, root rot will cause stunted and/or wilted plants. Affected roots would appear brown to black or roots may be mostly decayed. Phytophthora may be suspected if there has been a recent event of standing water or over-watering of the plant(s) and/or if there has been a history of the disease in that greenhouse or landscape bed. On-site identification can be difficult as symptoms may resemble other diseases. Be sure to get an accurate diagnosis of this disease by contacting your local extension agent or sending to the NCSU Plant Disease and Insect Clinic. 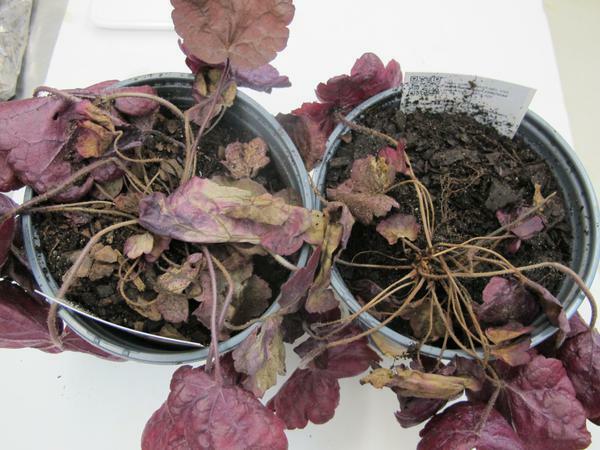 Symptoms of root and crown rot on Heuchera. Root and crown rot on pansy caused by Phytophthora sp. In general, species of Phytophthora present in North Carolina prefer warm, humid, and wet conditions. Prolonged irrigation or watering, poor drainage, and standing water all favor disease development. In the greenhouse, diseases caused by Phytophthora can occur at any time when host plants are present. In the landscape, disease is noticeable on annuals and herbaceous perennials during the growing season and when there has been significant rainfall or in areas with standing water. The pathogen can be transmitted between and among greenhouses on infected plant material. Within a greenhouse, swimming spores can survive and be transmitted to healthy plants by recycled irrigation water or from plant to plant in standing or puddled water. 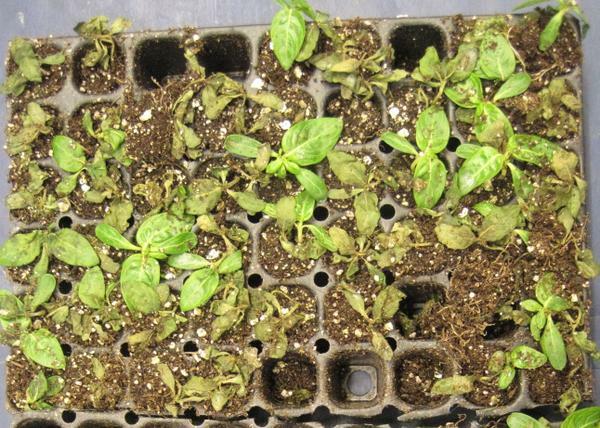 The pathogen can survive for long periods of time in soil, and can easily be transmitted to the next crop if infested soil is left on the greenhouse floor. In the landscape, soil can become infested when affected plants are established. The pathogen then spreads from plant to plant when sufficient water is present. The pathogen can survive in soil from season to season, so once the bed is infested the pathogen cannot be eradicated without extreme measures. Always inspect plants (above and below ground parts) and ensure they look healthy before purchasing or accepting them into your facility. Implement proper santiation practices for tools, equipment, benches, and floors. This includes removing any remaining plant material and soil and used pots or trays. A sanitizer may be used to clean greenhouse areas with a history of Phytophthora. However, plant debris and soil must be removed before product application as the activity of any sanitizer is minimized when in contact with organic material. Improve drainage in areas where standing water occurs. Remove and destroy any infected plants. Plant Phytophthora resistant or tolerant hosts in areas with a history of Phytophthora. Soil solarization of infested landscape beds may be effective for reducing the amount of the pathogen in the soil; however, this must be done during the warmest part of the year and this is usually when foliage and flowers are desirable. Although typically not cost effective, infested soil from a landscape bed may be removed and replaced with clean soil. A fungicide spray program to manage Phytophthora diseases is most effective if used preventatively and after the cultural practices listed above are implemented. If fungicides are used, be sure to alternate products with different FRAC numbers to avoid the pathogen developing resistance to the product. As always, be sure to follow label instructions. In the table, P means the product induces a host plant response and M means the product has activity on multiple sites in the pathogen and the risk of the pathogen developing resistance is low.